Our supplier, Philips Lighting, has published a UV Purification Application brochure highlighting how techniques in purification using ultraviolet light (UVC) have benefits of efficiency and energy effectiveness. Learn how Ultravations’ UltraMAX uses the natural power of ultraviolet light to control airborne allergens and microorganisms — bacteria, viruses and mold growth on HVAC interior surfaces. Here is an interesting and clear depiction of just how a virus, such as the flu, invades the body and how it manages to make you ill.
UVC is a proven disinfectant and is in use around the world to help reduce the concentration of all types of pathogens suspended in the air. Airborne viruses, such as the flu virus, do not differ from other microorganisms in that it is vulnerable to doses of UVC light — just as other germs are, ranging from the “regular” flu virus to the common cold. 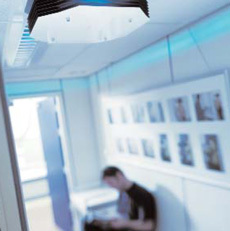 It is a well accepted technology and has been in use for many years in a variety of public spaces including hospitals. At right is a link to a video clip produced by Philips lighting, the worldwide lighting manufacturer headquartered in Europe—and a strategic partner for us with our own manufacturing—showing the application of UVC lighting for air disinfection in European hospitals.